Importing Sales Data allows you to keep costs and sales units in consideration when scheduling. When scheduling for any shift based industry it is important to schedule your staff based on the expected revenue to make more sales and pay fewer hours. For example, knowing that you typically make many sales on a Wednesday afternoon allows you to plan in advance how many employees to schedule. Deputy allows you to enter your sales budget against your schedule, either manually (as shown below) or using your POS system. For instructions on how to import your POS data to Deputy follow the steps shown in this article. Using the sales data in conjunction with the graph will allow you to create an optimal schedule to minimise costs and maximise revenue. If you are not importing your sales from your POS system (or would like to set your own forecast) you can manually enter the sales budget. To do so please go to the Scheduling page then click on 'Statisics', then on the left side, click 'Sales'. Sales are one of the default metrics included. To add Sales as a metric, click 'Add Metric'. For a guide on how to do this, click HERE to check out our Auto-Scheduling help guide. You can enter the budget for the whole week, entering a total for each day. The budget will be saved for the specific week you are looking at and will also be used for future weeks. If you want to set a specific budget for other weeks, you can simply select that week and repeat the steps above. A budget set for an individual week will be always be retained for that week. If a week does not have a budget set, the average of other weeks' budgets will be displayed. You can use the Deputy Import Wizard to upload a sales data file. For a sample sales data file, click HERE. To upload a sales data file, click the 'Sales' metric, and click 'Import from File'. The importer will then open in a pop-up. Either drag and drop your sales data file into the box, or click 'Import from Excel/CSV' and select your file. If your sales data is a currency amount instead of a unit, ensure that the metric is configured to read $amount and not units. For more information about this, click HERE for our Auto-Scheduling help guide. How Do I Use The Graph? Using the Graph can make analysing your data significantly easier. It will show you an overview of the shifts for a particular day, allowing you to visually compare your scheduled hours vs. your sales. If for example, you expect more sales in the middle of the day you can schedule your employees so that their shifts favour the lunch rush. The Blue indicates the scheduled hours and the Orange indicate your expected sales revenue based on prior data. The vertical axis indicates an increasing quantity and the horizontal axis indicates the time. A higher block of blue would mean more hours in a given period whereas a longer, shorter block would mean fewer hours total but longer trading hours. If you would like to quickly see the hours a particular employee is working then you can select the employee and refer to the graph to check, displaying the hours clearly in Red. In the Reports screen, the Roster vs Timesheet vs Sales report will give you a clear overview of past data. 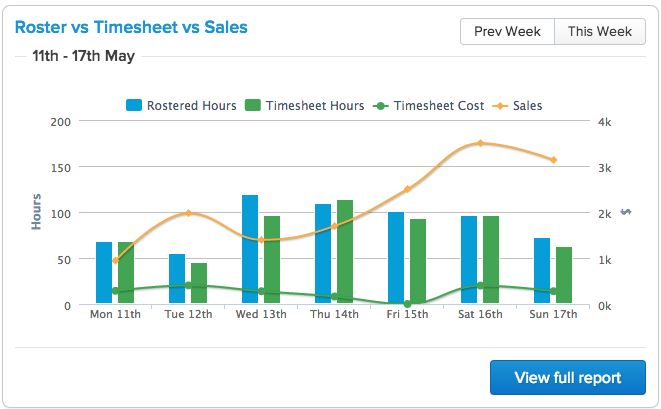 The graph preview will show the scheduled hours (blue) total hours approved (green) vs actual sales data (yellow). Running the full report will provide a detailed breakdown of the rostered hours for each employee, approved timesheet hours and the amount of revenue they generated for the business. You can toggle departments on and off in include/exclude their figures by clicking the checkbox on the left, next to the name of the area. For more information on our reports please read this article. For those organisations that do not calculate sales using a POS system it is possible to populate sales data via API. To find more information on the subject please visit our API site here, where you'll be able to find extensive documentation on the subject. If you have a specific question regarding the API please submit it as a help ticket following the instructions here. Depending on which integration you'd like to set up, you'll need different information at hand. For each, you will need your login details for that account. For Xero, you will also need Payroll Admin+Adviser permissions, or Standard access. For both Xero and Quickbooks you will need to authenticate your account on the Export step, shown here for Xero and here for Quickbooks. For Vend you'll need your store address, username, and password. Kounta requires your email address and password. 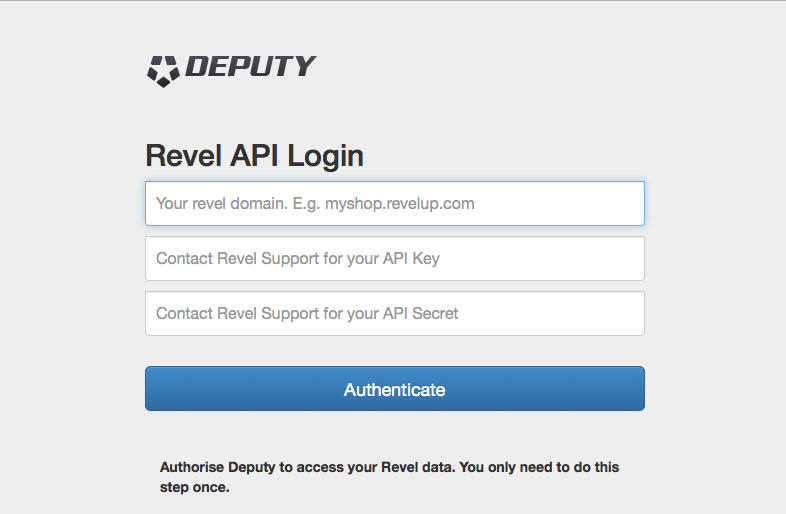 If using the Revel integration you'll need your API Key and Secret. If you don't know these please email the Revel Support Team and they can provide them. If you aren't using one of the mentioned systems you can use our Dropbox integration to upload the files via CSV. The files explaining how to do so will be created in Dropbox for you when you create the integration. Depending on the service selected (shown below) you will be able to set up various types of integrations, allowing you to automatically start shifts, input sales data, create new users and start timesheets from your POS system. 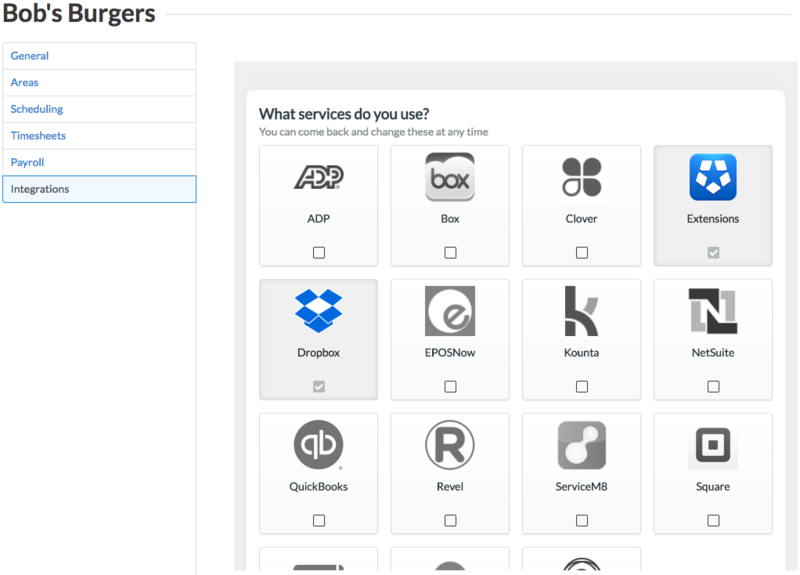 We recommend selecting each service to see the full list of possible integrations. If you have any questions about a specific integration, please chat with one of our friendly support team using the chat box in the lower right corner of the Help page. Please note that if you're setting up integrations for multiple locations within your account, you can find an option within the integrations that will allow you to do so. This will be explained below. 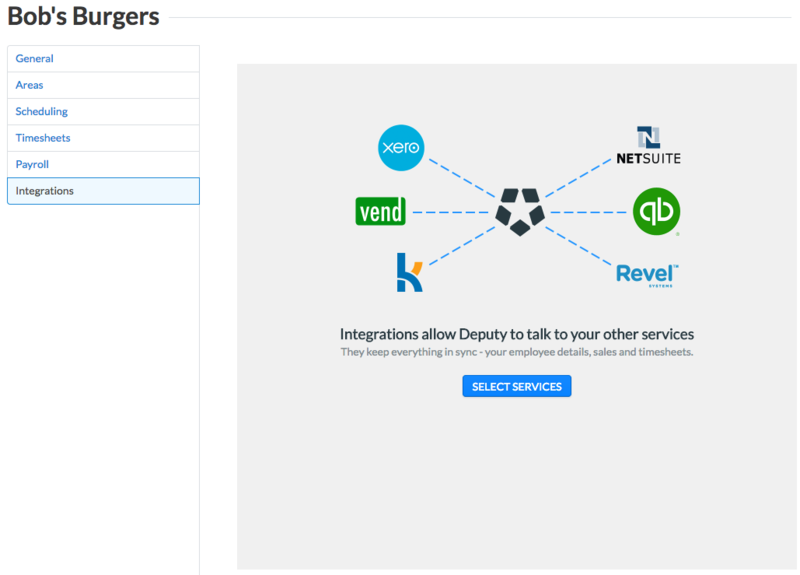 To access the integrations, please first log into your Deputy account and go to the Locations tab. Please click "Settings" on the right side of your screen, next to the location in which you wish to create the integration. Next, please click "Integrations" at the bottom of the list of options to the left then click "Select Services". Please select the integration you'd like to set up. You can select more than one option here if necessary. Next, please click "Continue". From here, please click "Authorize" to the right of the integration you'd like to set up. We'll use Revel as an example. The system will open a pop up window (please make sure you have pop-ups enabled) requesting the details mentioned in the Before You Start section. Please enter them and allow access. Depending on the integration chosen, you will also see an additional option reading "Filter Outlets/Establishment" and a second option reading "Deputy Department/Area". 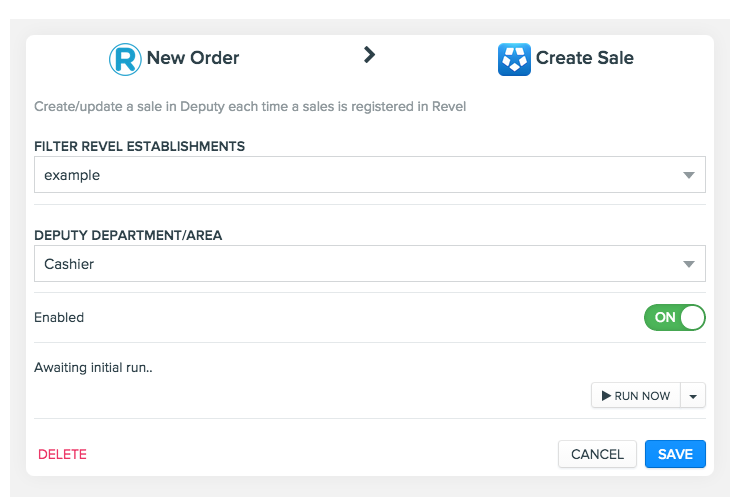 The "Filter" option is where you are pulling the sales from in your POS system, and the "Department/Area" option is where you are applying the sales in Deputy. You can use "Match with Outlet Name" if your Areas in Deputy match your Outlets/Establishments in your POS. If you'd like to turn the integration on for all locations, please click "Turn it on for all locations". After completing the process and running it (below) please check each location and set the establishments. After creating the integration you'll see the option to Edit it. Please do, where you'll see the option to Run the integration as shown below. Running it will make it active from now on. That's it!